I'm so excited because my sister (my baby sister that is) is coming to visit tomorrow! We are going to have so much fun playing with cleaning up details for my riverboat stitching cruise Party on the Po! It doesn't seem possible that it is only a few short weeks away! It is going to be so much fun! And I get to share the trip with my hubby, our daughter, and my sister! And, since the beginning stages of this journey, I have been able to add a few new friends as well, but there are many, many more to meet f2f and to become better acquainted on this trip! I'm busting (yes, I said busting not bursting) at the seams! 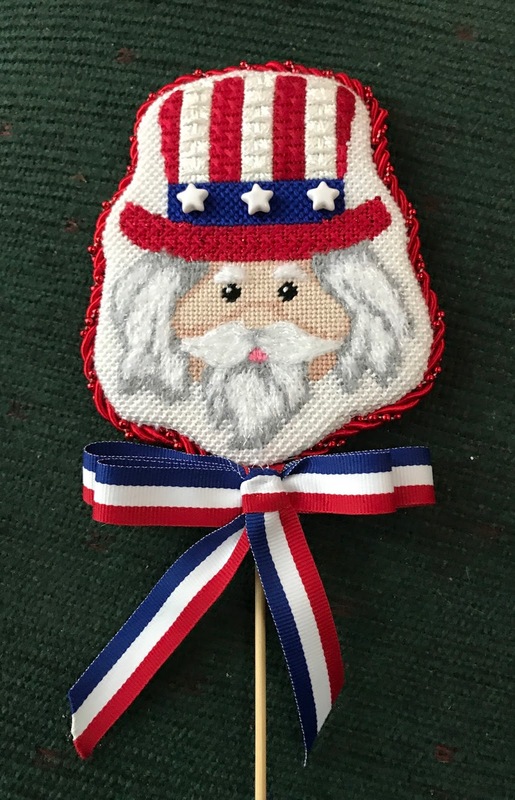 Another bonus is that I have introduced my sister to needlepoint. We all have a history of crafting, crocheting, knitting, embroidery and cross-stitch in our family but not many do needlepoint. She seems excited about it and is very open minded - which is the main factor in conquering any new adventure in my opinion. Wait till she sees my stash! Oh dear! (She questioned if I had permission to post her picture so in the normal sisterly fashion I showed her and blocked out her face! So there!) Notice that I have started her with stretcher bars! Time is fleeing by quickly for the next new Online Mystery Class to be introduced. 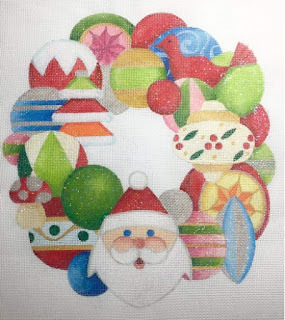 Raymond Crawford's Santa Ornament Wreath will begin mid-September. There are so many possibilities in this fun class! Kits will be mailed this week so if you have ordered through our resource start watching for them. You will be sent an email letting you know that they are in the mail. Still time to join so email me at duodesignsinc@yahoo.com if you want to play with us. What's up next you ask? 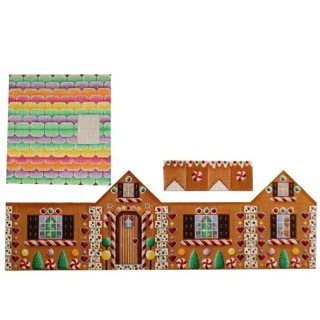 Well the fantastic Gingerbread House from Rebecca Wood. This 3-D design will be approximately 9" square when finished. Registration is ongoing so email us at duodesignsinc@yahoo.com to be placed on the notification list. The first lesson is scheduled to be posted mid-November. The 6-lesson packet fee is $150 for the 6-month class. 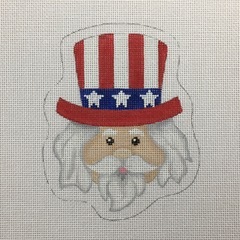 Also on the horizon is the beginning class for Uncle Sam from Pepperberry for our Quickie Series. Emails will be sent to let you know that the kits are on the way to the participants. The first lesson will possibly be posted before the 15th. 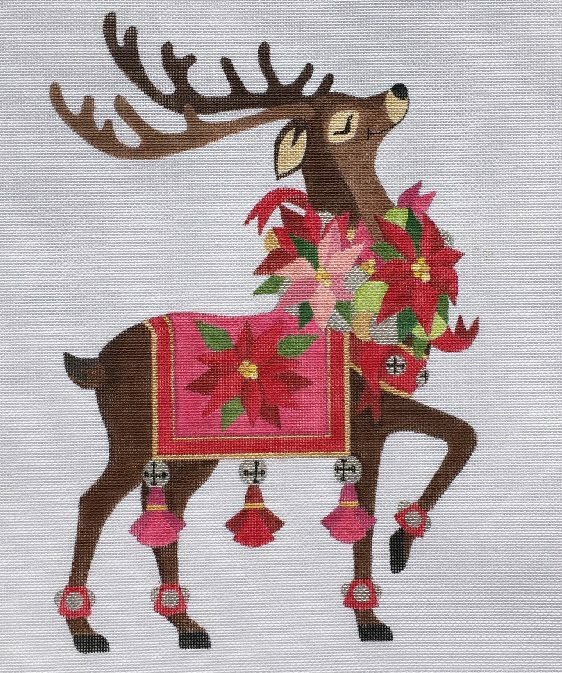 The all inclusive kit is $135 - handpainted canvas, threads/embellishments, 2 lessons in pdf format and shipping/handling. Still time to join us so email me at duodesignsinc@yahoo.com to participate. Oh My Gosh! I just received my Reindeer by Raymond Crawford canvases! I cannot wait to share with you guys! Which to do first? Just email me if you think you'll be interested in a class around the first-mid year! This class looks like it might lend itself to being a little different than the regular Online Mystery Classes. My mind is spinning. I think a lot will depend on how people approach it. 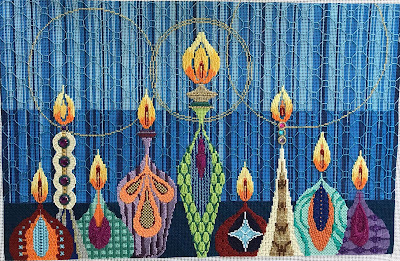 At first glimpse, I think I am approaching this as a matched set that will be either hung together as a group, finished as matching stand ups, pieced together as a wall hanging (as shown in one of the promotional photographs) or pieced together to make a bolster pillow. So many possibilities. And you can do one or all 4 - - - these will be even more beautiful when we are finished. Email me at duodesignsinc@yahoo.com if you would like to be notified when more particulars are available. No obligation at this point. 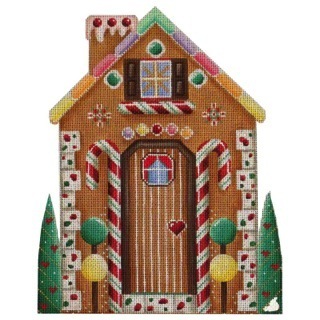 Let's see, beads, ribbon, glitz, bling, on and on! And those sweet, sweet faces. Beginning and ending threads seem to perplex some so I'm addressing that issue today. Students are forever asking how to being and end threads? How to hide a thread under a thin stitch? How to secure fussy, slick threads? Some methods that work for me are shared in this document. I refer to a couple of techniques I use as a waste knot and an away waste knot. What is the difference? A waste knot, also known as an inline waste knot, is a knot in the end of your thread that is placed on the topside of the canvas. This knot is placed in an area that will be inline with the stitching. I refer to this as an inline waste knot. It is necessary that the beginning thread on the back lay ‘inline’ with what stitching is to come as the stitching will cover the waste knot thread on the backside and these hold the beginning thread secure in place. While stitching, once the waste knot has been reached, it is safe to cut the knot away and continue stitching. If you check the back you will see that the stitching covered the beginning thread securing it in place. Another method that I teach I refer to as an away waste knot. This knot is handy when there is not a large area to be stitched and/or you do not have the luxury of knowing there will be enough stitching to secure the beginning thread in place. This knot must be placed an ample distance away so that when the knot is cut there is enough thread to thread the needle and work the beginning thread through the back of stitches that will be in place later. I suggest a minimum of 4-6”. This knot, too, is placed on the front of the canvas. 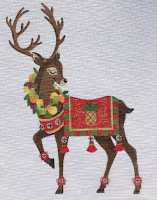 One troubling beginning is for when there is an isolated stitch such as a simple star, cross stitch, etc., that is placed out in ‘never, never land’ somewhere and there is nothing around. And there is likely to not be anything around. This is especially a problem if the stitch is contained in an open area. One popular technique is often referred to an a pin stitch or an ‘L’ stitch. The thread tail is on the back of the canvas. 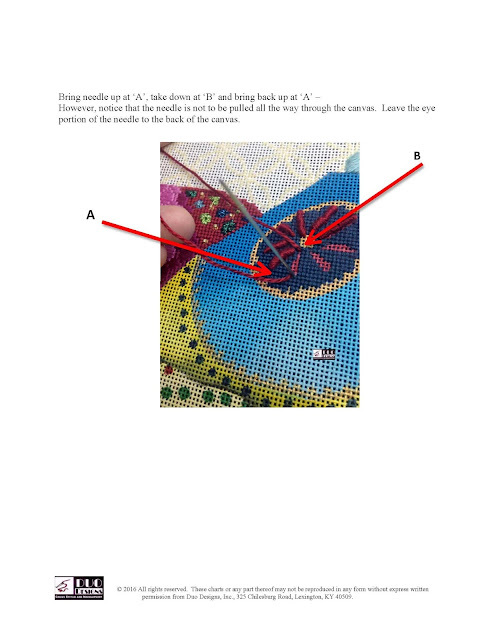 Bring thread to the front of the canvas at ‘1’ and follow the diagram. 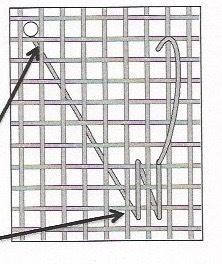 Once this stitch is in place you may stitch the technique required for your design over the threads. 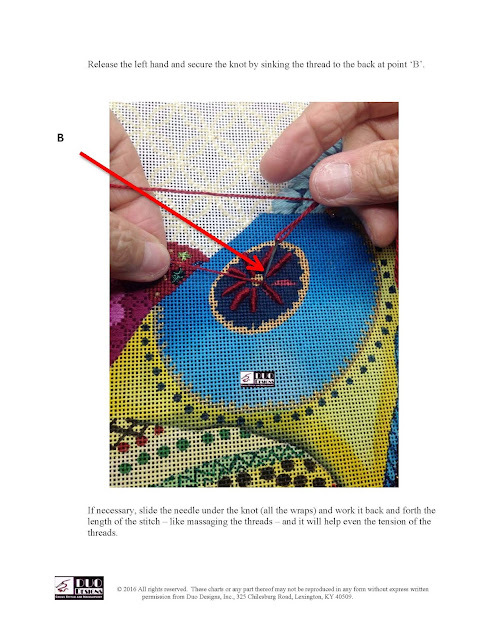 A method that I am particularly fond of is great for when you must push aside a thread – such as a long vertical or horizontal thread - and stitch underneath it to secure the thread. It is the good ole’ backstitch. Two or three stitches are more than sufficient to secure the thread – beginning and/or ending. 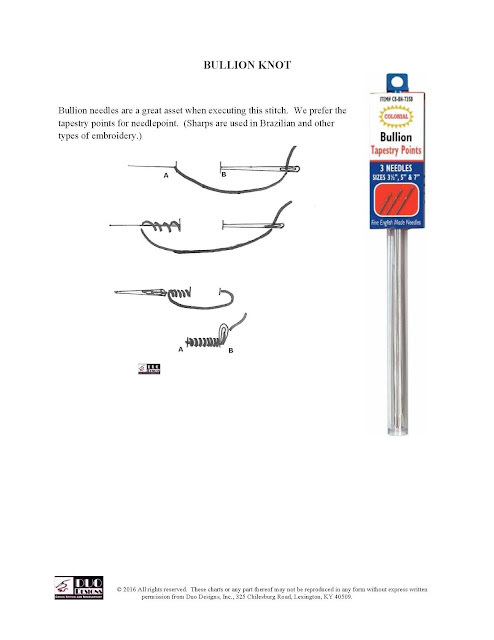 Another troublesome issue is securing slick or slippery threads when finished. In this instance I prefer to use a Bargello tuck. 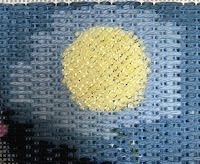 This requires the ending thread be run under several finished stitches on the back of the canvas. 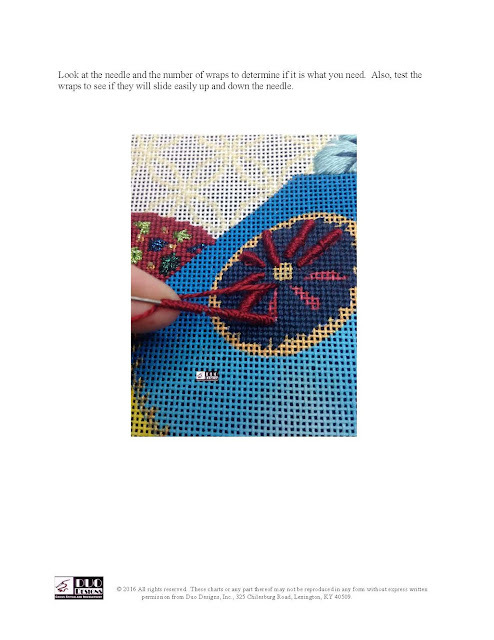 Then bring thread up and over a canvas thread and slide the ending thread under the stitches in place once again – this time moving in the opposite direction. Hope that some find this useful. 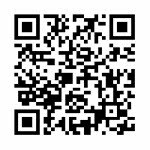 TIME FOR NEW LESSON POSTINGS! Oh my! I am so tickled with my Uncle Sam the exclusive from Pepperberry Designs. I love this guy! This is the next scheduled piece in the QUICKIE SERIES! 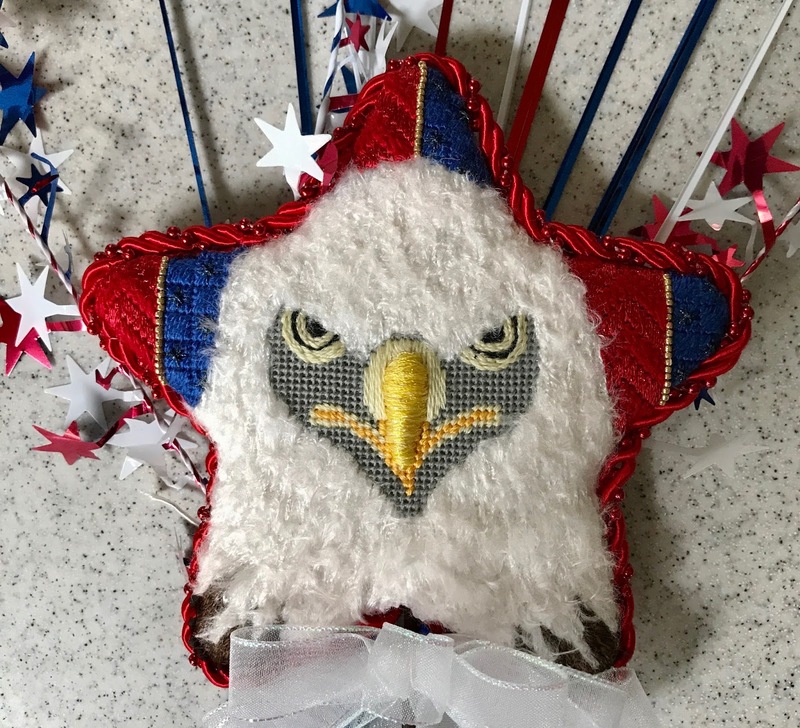 I think he is wonderful and fits right in with the previous QUICKIE pieces that we have done - the USA Star and the Eagle Star. The first class for this design will be in the next couple of weeks. If you want to join us just send me an email to duodesignsinc@yahoo.com and we'll get you included in the participating group. As stated previously, the all-inclusive class (handpainted canvas, threads/embellishments, 2 lessons in pdf format and shipping/handling) is $135.00. Limited number of kits. Gosh, it seems like we are just whizzing through these works in progress. Everyone is doing great and I am having a ball. Time to say goodbye to Menorah. 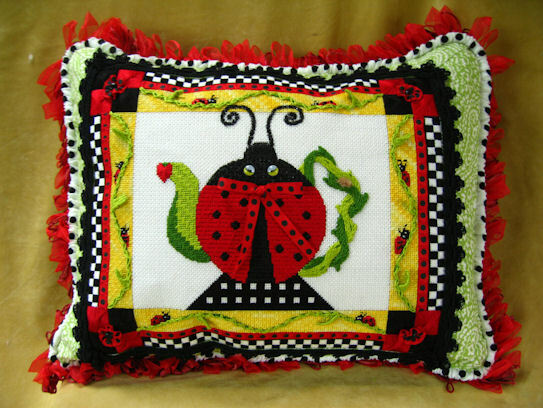 What a plethora of stitches, techniques and threads! I so enjoyed this class and my students. Such great questions and I am hopeful that they learned some new somethings. The stitches were easily adapted to the individual canvases that Tapestry Fair also markets. Check it out with your LNS. 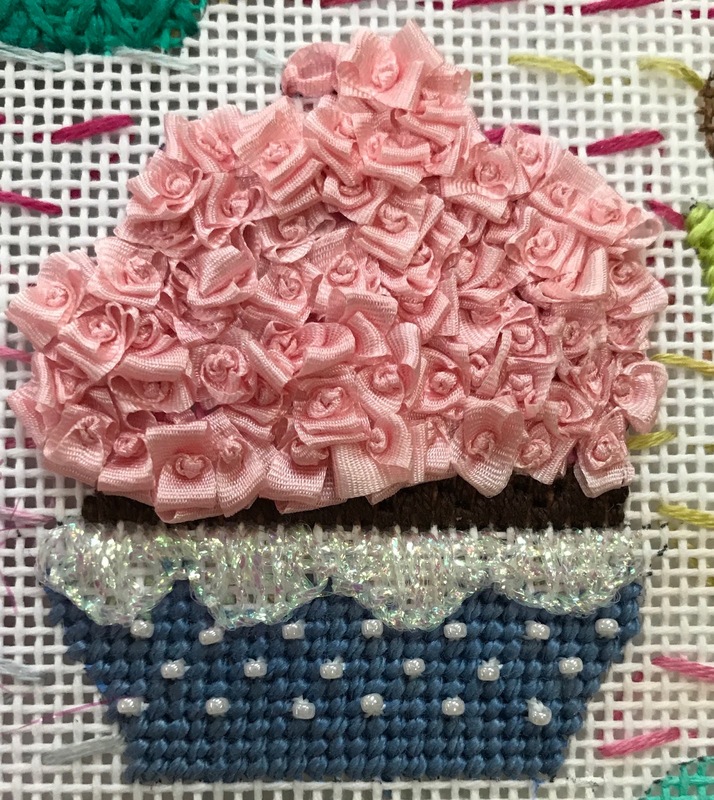 Before long we will be sharing a commercial stitch guide - after I get through cutting out all the tutorials and WIP pictures that come with the lessons for the Online Mystery Classes. Danji's canvas of the Songbirds gives us room to play with a particular technique. 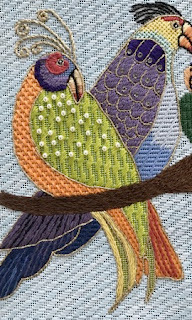 This current bird let us add a stitch for the wing that showed some downward movement. Plus we had fun giving the head different features. 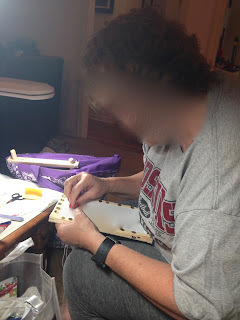 And, of course, don't forget the beading. 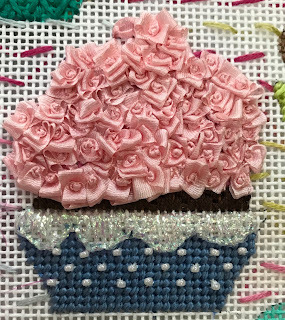 We played with ribbon roses and a scalloped buttonhole technique on this design from BB Needlepoint. And, well what do you know - beads. 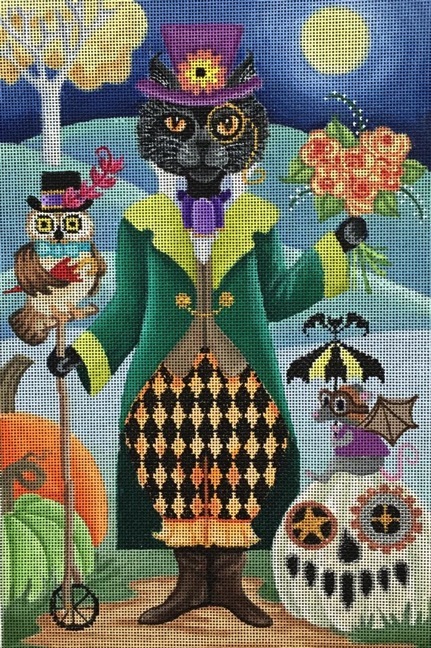 Steampunk Cat got his Session 1 posted this past week. We did lots of background work including the moon and the sky. Lots to do on this guy! Phew! Guess who is up next? Santa Ornament Wreath! Just look at all this stuff! We are going to work with so many fun threads and embellishments. Did I say beads? Shiny! Metallic! Fuzzy! Oh my! If you have not yet joined us do so right away. Invoices are being processed for the lesson fee. Get your canvas from your LNS right away. If you need assistance contact us and we will see that you get what you need. email duodesignsinc@yahoo.com. Invoices for the thread/embellishment kits will be processed shortly. Those who indicated a need will receive an email with more details. Did you see the new design from JP Designs? Oh my gosh! We just have to add this to our Catitudes and Dog Gone Good series. 2018 is already filled with so much excitement for me! I love colorful, happy canvases! 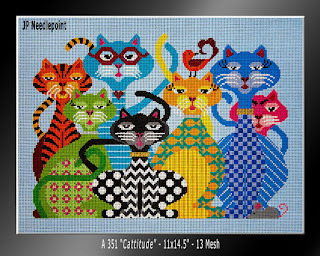 CATITUDES is scheduled to begin mid-March with invoicing around the first of February. DOG GONE GOOD is scheduled to begin mid-May with lesson invoicing around the first of April. 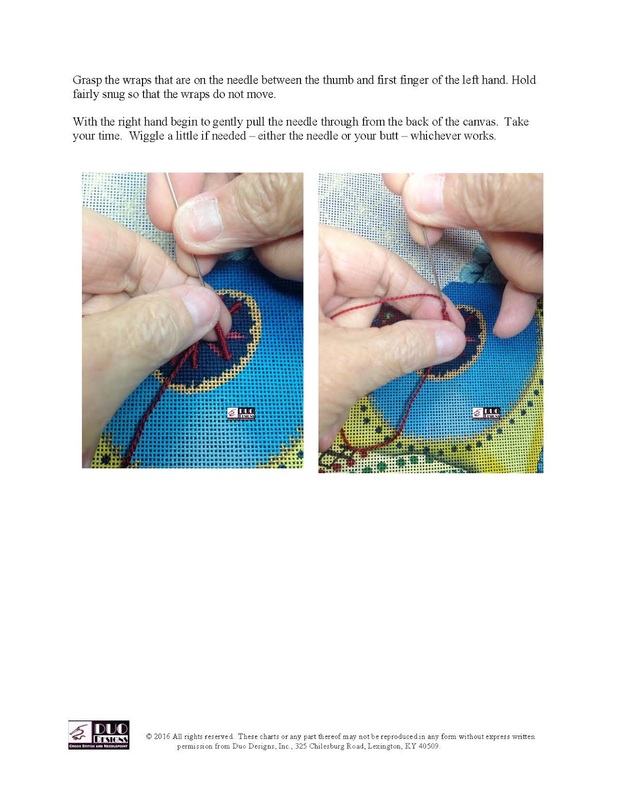 I am sharing a teaching pdf that I use illustrating how to execute a bullion knot. I feel strongly that the success of a bullion knot lies in the needle being used. 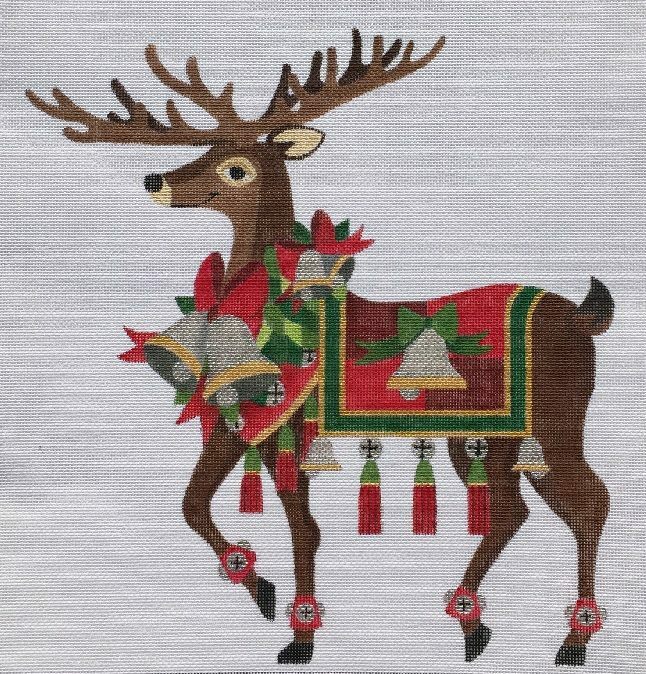 We are fortunate that Colonial Needles has expanded on the traditional needle used in Brazilian embroidery and added a blunt end as well as a larger eye. 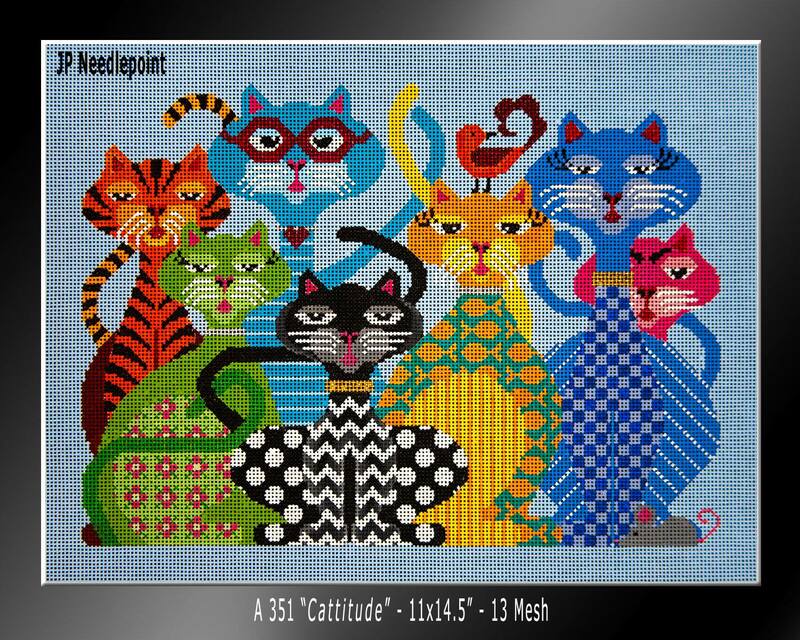 Much easier to use in our needlepoint projects. 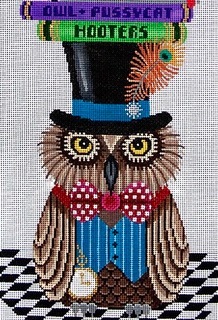 ENJOY and have a great week with some fantastic stitching - which you should do with a smile! As we prepare to post the upcoming Lessons for the Online Mystery Classes in three more days, I just wanted to bring you up to 'snuff' on where we are on other items as well. 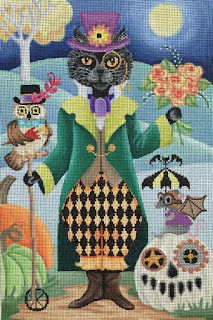 We will be introducing Steampunk Cat from Brenda Stofft as our next new Mystery. 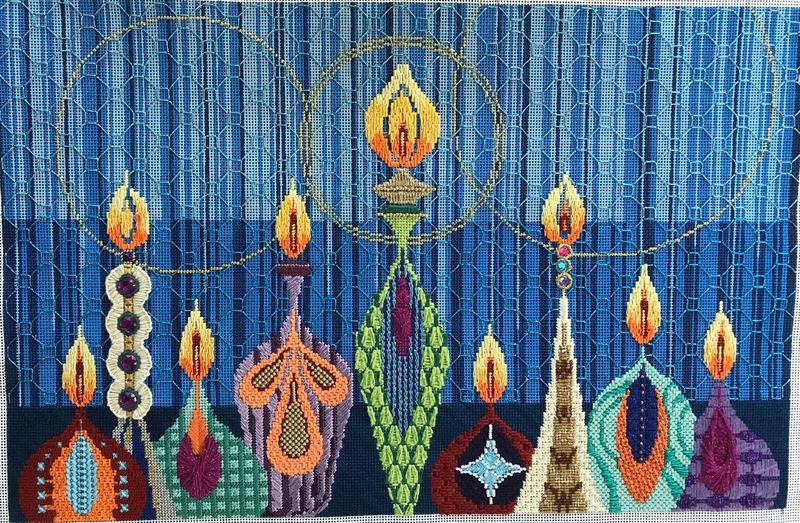 As is pretty much typical for me, I try to start with the background first and get all that in place for a foundation upon which to build and stitch all our other fun stuff. So, Session 1 included the moon, sky, some hills, etc. You may still join if you would like to do so. Just email me at duodesignsinc@yahoo.com. The first lesson will be posted Tuesday, August 15. Lesson 2 for the QUICKIE SERIES - We must bid farewell to our Eagle Star from Raymond Crawford. 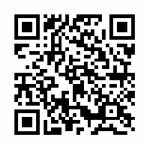 Lesson 2 has been distributed. If you did not receive your complete kit or the lesson please contact me right away. You may still participate in this class as well if you desire. Email me at duodesignsinc@yahoo.com. The full kit is $125. Watch for the finished picture in the next day or two. This class is $135 all-inclusive. The first lesson will be mailed around the first part of September if not sooner. If you would like to participate just email me at duodesignsinc@yahoo.com. This is the last picture you will see of the unstitched canvas! (hopefully!). He is being finished, finished as we speak. Santa Ornament Wreath from Raymond Crawford is slated to begin September 15. As you may recall, this guy is the 'No Stress, No Schedule, No Deadlines, etc., etc.' class. I am currently stitching the first Session and will be sharing that soon. The canvas is by JP Needlepoint. Get it ordered right away from your LNS. Let me know if you need assistance and we'll track one down for you. duodesignsinc@yahoo.com. Lesson packets have been invoiced and processed. If you did not receive and think you jointed, just email me as above. 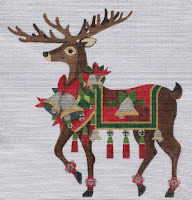 We are working on the new Reindeer designs from Raymond Crawford to include in our upcoming Online Mystery Classes! The criteria may be a little different from the normal sessions. I am thinking of possibly doing 4 sessions at every other month but a little more in depth. Also, I want to squeeze them in beginning around January possibly. Stay tuned for details as they develop! Compensation! So many hate the word much less the process. I tend to approach compensation as a simple matter. Look where you need to go from where you are to do a particular stitch, then cut it off where you are required to stop on the canvas. It is not always going to be a beautiful line depending on the technique, etc. But, it will be a necessary line to stay true to the design. 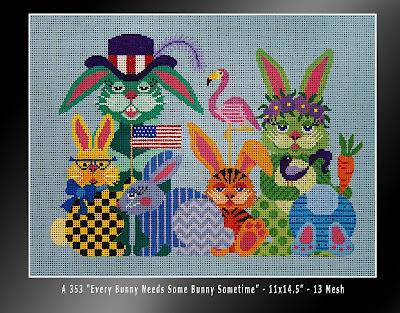 It is obvious that these full stitches would not give the end results that might be desired for this piece. It would create a very ragged heart shape. 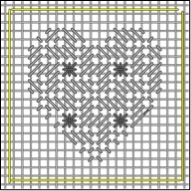 Let’s examine the stitches that cross over our heart shape and see how we can mitigate the damages. 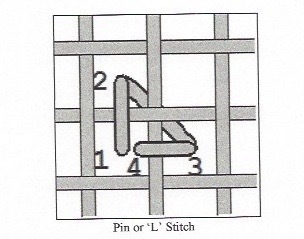 The red portions shown are illustrating where the stitch should actually end. But how do you accomplish this and still have the thread laying in the desired direction? 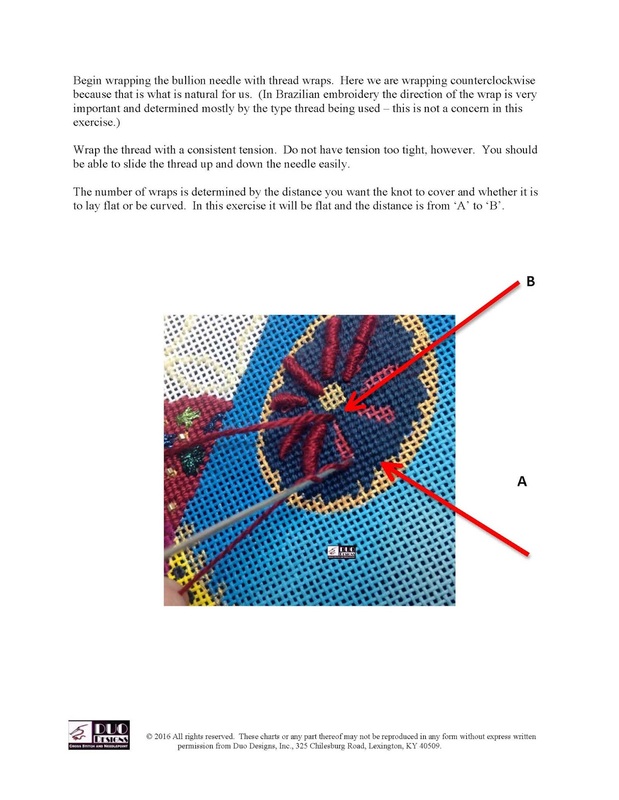 My method is to begin the stitch execution as it would be without considering compensation. Look at the top right corner of the heart shape for instance. 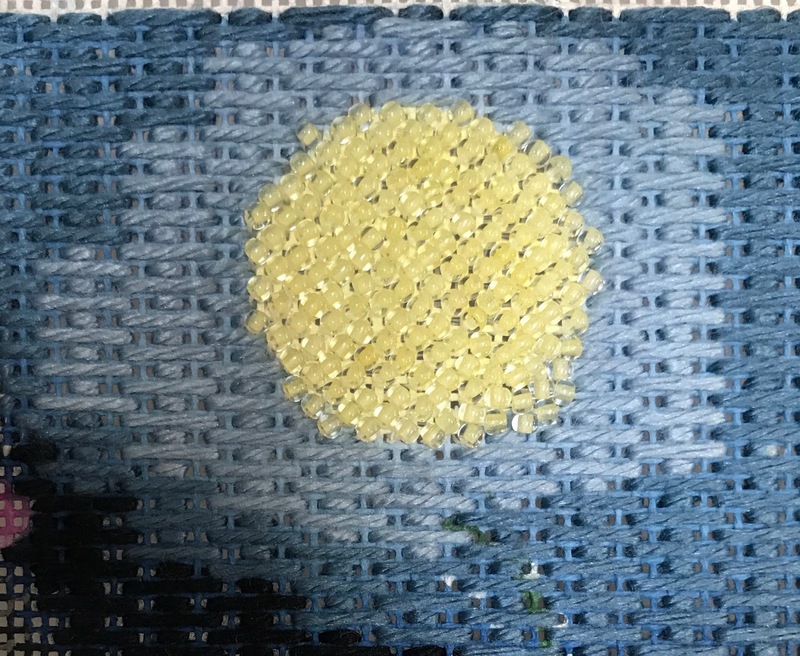 The next stitch calls for a diagonal Gobelin over 2 canvas threads moving from lower left to upper right. 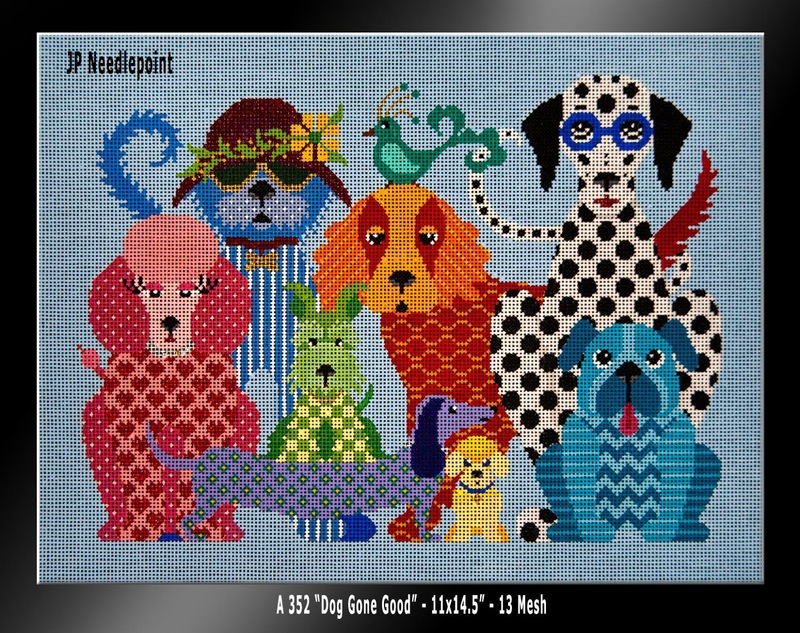 Bring the needle up at the bottom left corner as if to execute the full stitch (where the red is). Now lay the thread on top the canvas and hold it in place as to where the full stitch would go to the back if there were space to do so. 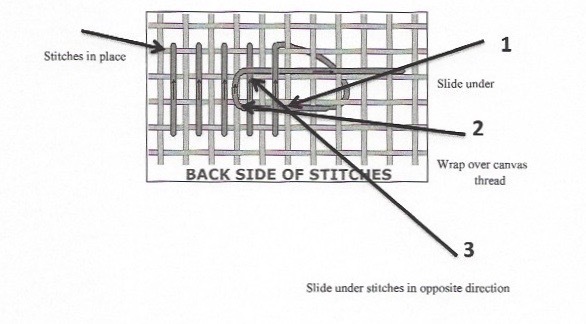 This process allows the thread to lay the way the stitch normally should and it passes over the area where the stitch needs to end. You can now see that you need to plunge your needle at the outline where the red stops and have the stitch laying properly. The compensated stitch is in place. 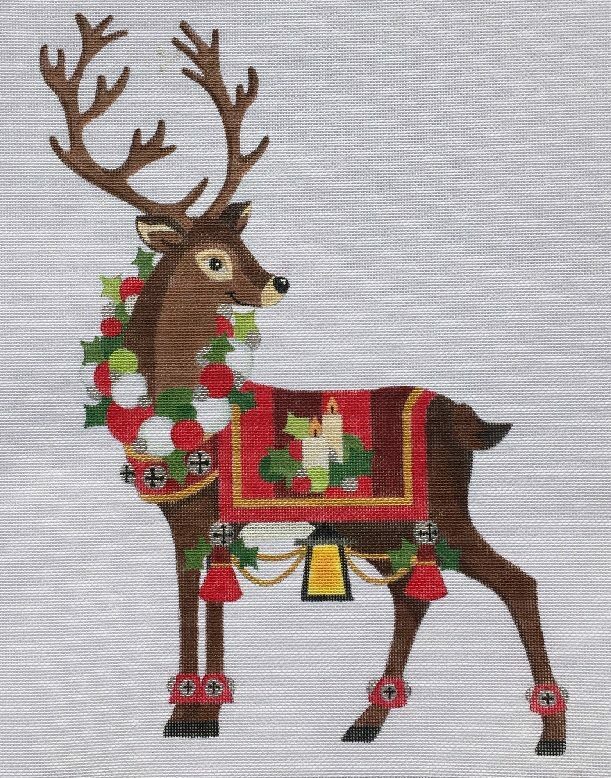 Look slightly to the left of the stitch just discussed. 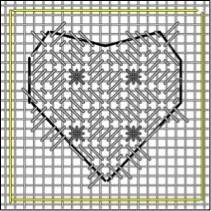 Now the stitch calls for a diagonal Gobelin stitch but facing in the opposite direction of the ones just executed. 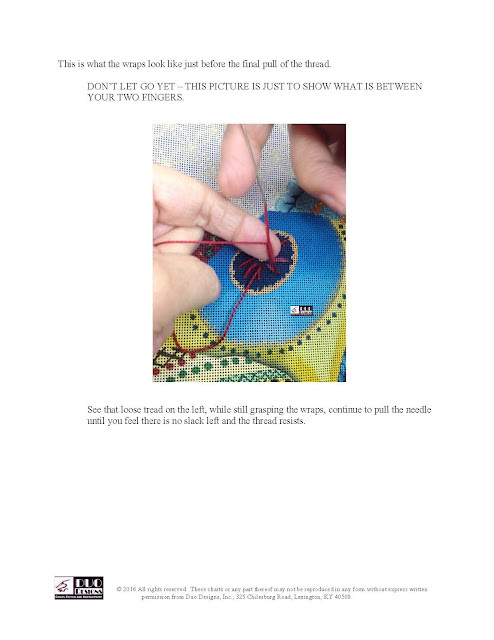 You do not want to just stick a tent stitch in there going from left to right , that would have the stitch going in the wrong direction – you need the stitch to lay from right to left. Again, bring the thread to the front as if stitching the normal full diagonal Gobelin stitch. Lay the thread across the top and hold in place. Plunge the needle down where the design line stops – the little red marks. 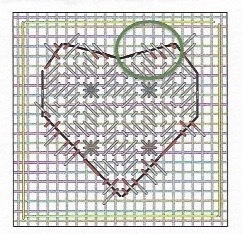 This altered illustration shows how the heart would look if stitched within the outlined area. 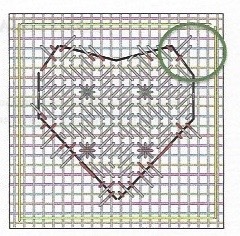 When doing the actual stitch some adjustments may be made to make the area more appealing to the eye. As an example, the original heart shape was very angular. Notice that an adjustment was made in the upper right section of the heart and full stitches were used in place of those that were originally going to be compensated (the second heart with red lines).This resulted in a more rounded and pleasing shape. Hopefully, this exercise will assist in at least getting the stitches in the proper position for compensation. Design area and personal choice will dictate the actual stitch length, etc.